In their forward to the first issue of Our Homes and Gardens, the publishers wrote: “There is a widespread demand for a better manner of house design; rooms planned in keeping with present-day needs; furniture that is graceful while at the same time being suitable for everyday use; window hangings and floor coverings that are both serviceable and pleasing to the eye; and last but not least, features belonging to the equipment of the house – such as cooking ranges, sinks, heating apparatus, labour-saving appliances – that will ensure the utmost convenience and economy. All these things shall find representation in our pages”. 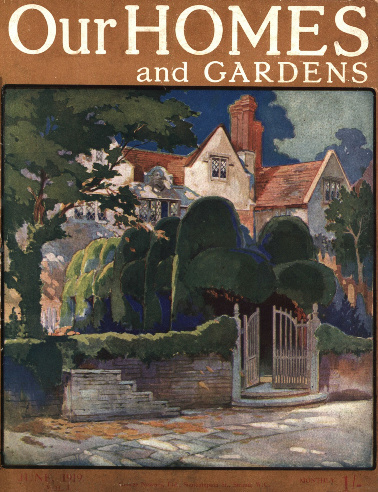 The magazine is extensively illustrated and is an interesting record of the furnishing of the middle-class British home in the immediate post-World War One years.